One’s a guitar synth machine, while the other’s an ’80s-inspired tape reverse simulator. This device is packed with 11 guitar synth options, including vintage synth emulations, thick, stacked voices and searing lead sounds. Heading straight into the pedal’s controls, you’ll find a Type knob that lets you cycle through the 11 presets, ranging from Blast to Blister. You can then modify a key parameter in the selected preset via a Ctrl knob – this varies between each preset. The pedal also features an expression pedal input so you can control a parameter in real-time. The mix can be tweaked by adjusting the Dry and Synth knobs together – these control the dry guitar signal and synth volume at the output, respectively. And in terms of tone refinement, you can adjust the Sens knob – short for sensitivity – to modify pedal’s responsiveness to your playing style. 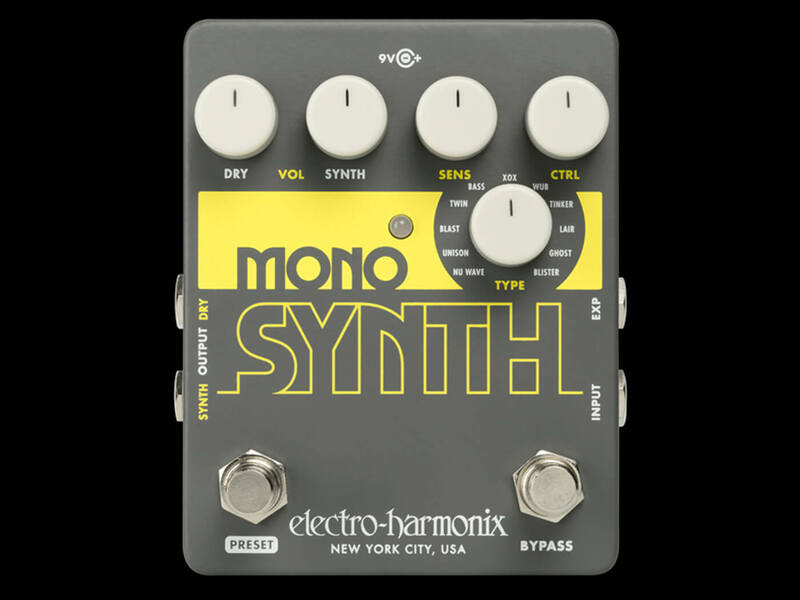 Finally, the Bass Mono Synth features a Preset footswitch that lets you save and recall presets with the push of a button. 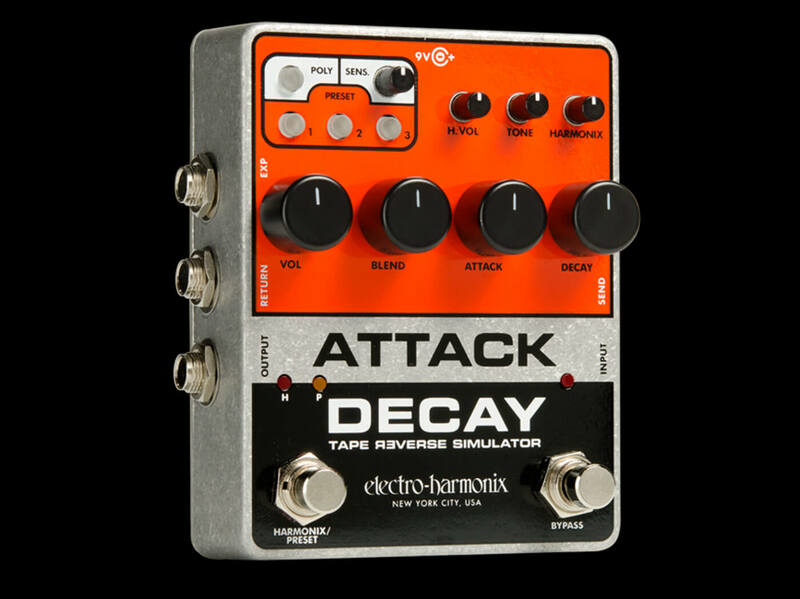 This pedal is a tape reverse simulator that’s based on EHX’s 1980 Attack Decay stompbox. It can produce a variety of sounds, including volume swells, reverse tape effects, artificially shortened staccato notes, and bowed instrument effects. The Attack Delay has two main modes: Mono and Poly. The former lets you produce a single volume envelope that’s similar to the 1980’s unit. The latter, on the other hand, gives every note a separate volume envelope, and can be engaged by pressing the Poly button. Additionally, the pedal features a built-in Harmonix fuzz that makes the effect a little hairier and produces bowed instrument sounds. This useful effect can be tweaked via dedicated volume, gain and tone controls. Otherwise, the pedal features four main knobs – Volume, Blend, Attack, and Decay – as well as three preset banks, an effects loop, and an EXP/CV input.